04. I Know You, Stanley Milgram! Although we'd almost given up hope, there seems to be a parallel universe away from anaemic supermarket muzak, restless radio formats and short-lived trends after all. There still is music which allows its listeners enough space for unlimited enjoyment, unfolds all its glory on top of lavish arrangements and takes the liberty of celebrating sounds and harmonic sequences in the elaborateness they deserve. This music is available here and now, thanks to Long Distance Calling, a five-piece from Germany's Münster region. Their second album, Avoid The Light, will be out on 24 April 2009 on Superball Music and promises everything you find yourself looking for without avail in most contemporary bands: an immediate coexistence of depth and exaltation, melancholia and joie de vivre, great gestures and small peculiarities. 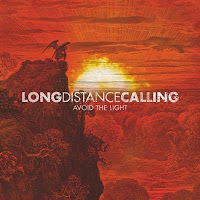 And somehow there's so much more to discover in Long Distance Calling's music: Avoid The Light opens a big gate which you step through to find a great diversity of moods and atmospheres. The basics consist of instrumental guitar rock with an ambient flavour, an oscillation of psychedelic and progressive rock elements. At the same time, Avoid The Light is an album which requires few words to communicate a lot. Should we call it post rock? Or perhaps new art rock? The label is irrelevant, it's the content that matters. Reactions to Long Distance Calling's debut, Satellite Bay (2007), were unanimously positive: "Off the beaten track, away from the hype fostered by bumptious music publications, away from all fashionable trends and the maundering zeitgeist, without a 3-minute corset but a with a lot of persistence," commented a reviewer in the magazine, Schallgrenzen, by all appearances covering all important benchmark data that mark Avoid The Light. At the same time, the five band members, David Jordan (guitar), Janosch Rathmer (drums), Florian Füntmann (guitar), Jan Hoffmann (bass) and Reimut van Bonn (ambience), impress with an even more open-minded and progressive approach on Avoid The Light. According to the musicians, the six new tracks present "an even wider stylistic range than our debut and are – as a direct consequence of our numerous gigs in 2008, with Dredg, at the Rock am Ring and Roadburn festivals, among others – faster, more haunting and more dynamic. Thanks to the thoroughly positive reactions to our first release, we have generally become much keener on experimentation." In view of the whole album's atmospheric density, there seems to be little point in highlighting individual tracks, yet the impressive opener, 'Apparitions', with its hypnotic flair, 'I Know You, Stanley Milgram! ', an expansive number in terms of playing time and style (coincidentally, Stanley Milgram happens to be an interesting character who is definitely worth googling), and the closing track, 'Sundown Highway' with its sophisticated guitar work should not be left unmentioned. As its predecessor, Avoid The Light features – along with the five instrumental tracks – a number with a renowned guest vocalist. While Satellite Bay presented The Haunted's Peter Dolving, Jonas Renkse (Katatonia) recorded the vocal number 'The Nearing Grave' on the latest Long Distance Calling release. "We're all great Katatonia fans, so it seemed the obvious thing to do to ask Jonas." Avoid The Light was produced by Kurt Ebelhäuser (Blackmail, Donots, among others), a true master of his art. "The collaboration with him had a thoroughly positive effect on our sound," observe the band members and can be confident that the transparent production does justice to their fascinating compositional parameters at all times. What a band, what an album …"
The link is up m8. It is certainly interesting for me to read this blog. Thanks for it. I like such themes and anything connected to this matter. I definitely want to read a bit more on that blog soon. Pretty interesting site you've got here. Thanx for it. I like such themes and everything connected to them. I definitely want to read a bit more soon.